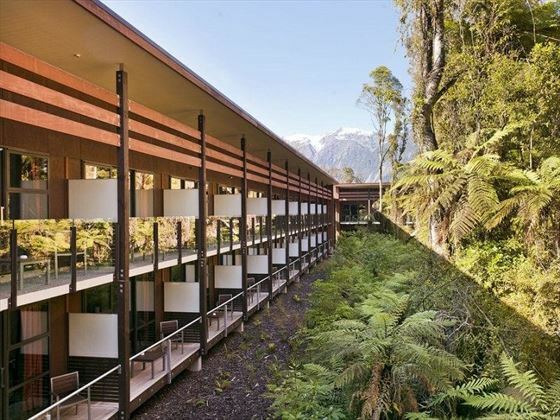 Tucked away within the luscious rainforest near Franz Josef Glacier, Te Waonui Forest Retreat is a beautiful oasis where wellbeing is key. Clearly inspired by the surrounding’s tranquil ambience, we love that this hotel puts not only the guests’ comfort as top priority, but environmental preservation too. This is certainly the place to unwind. 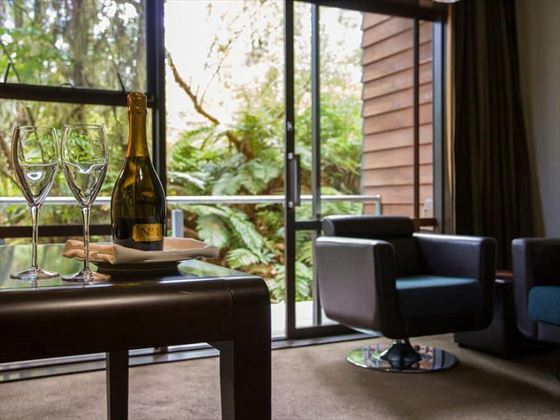 With contemporary rooms offering gorgeous views of mountains and rainforests, plus a gorgeous spa offering revitalising treatments, there’s plenty of space to relax. The Canopy Restaurant is spectacular. A terrace jutting out into the rainforest, sumptuous five-course dinners created with local cuisine…this is the ideal spot to indulge and enjoy time together under the stars. 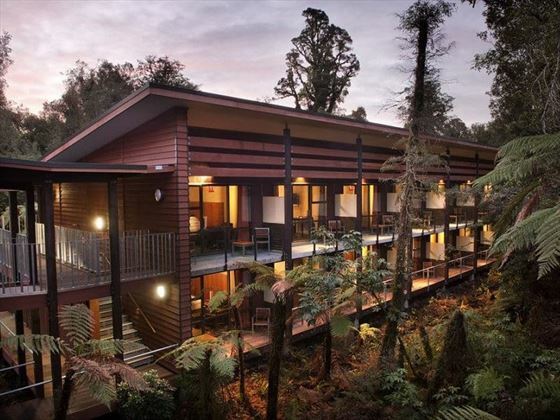 This serene retreat is nestled in the verdant rainforests near Franz Josef Glacier, offering a secluded and private atmosphere. 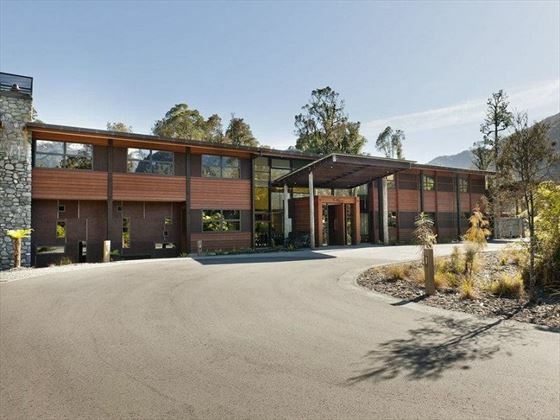 The rooms are located in four separate accommodation wings: Kahikatea, Totara, Rimu and Matai. Deluxe Hotel Room Twin – Sleek rooms featuring two queen size beds. Sleeps a maximum of three adults and one child. 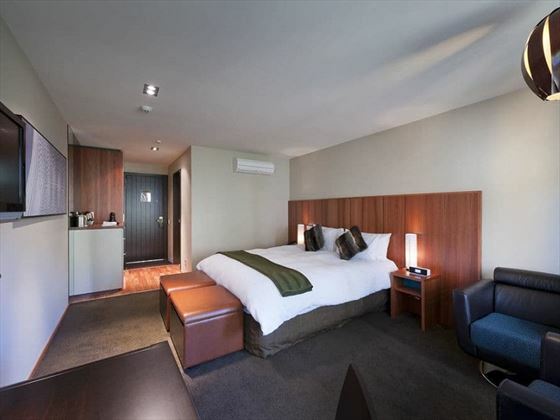 Deluxe Hotel Room King – Spacious, contemporary rooms featuring a king size bed. Sleeps maximum of two adults. 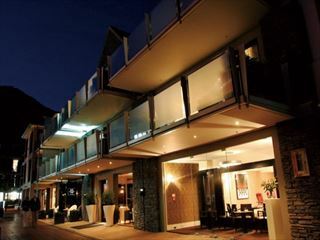 Deluxe Hotel Room Disabled Access – Gorgeous rooms with one king and one single bed, plus disabled access facilities. 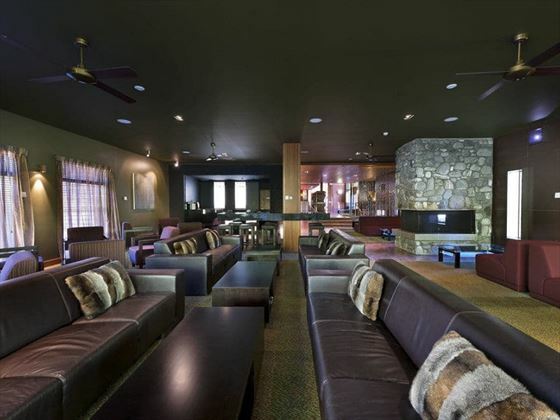 Frond Lounge Bar – A charming, country-style lounge offering a variety of drinks outside in the sunshine, or inside by the warming fireplace. 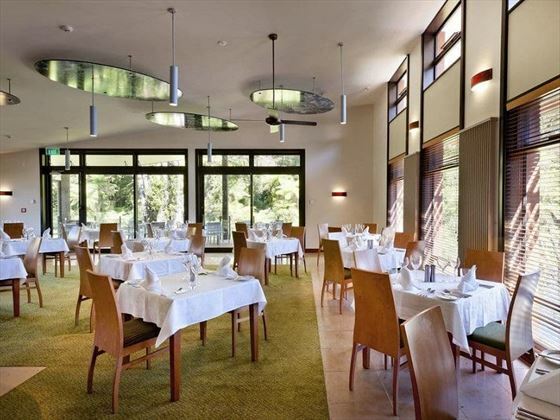 The Canopy Restaurant – A gorgeous restaurant high up in the trees, with a picturesque outdoor deck jutting out into the rainforest. Enjoy a five-course dinner created with fresh, local produce. Amaia Spa is a beautiful spa provoking a sense of wellbeing, offering a variety of treatments including massages, facials, and foot rubs. 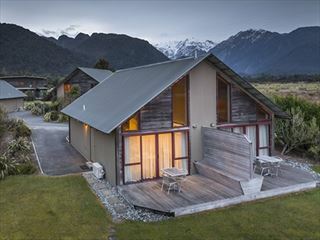 Based close to the dramatic beauty of Franz Josef Glacier, Glenfern Villas offers comfortable and charming accommodation in a fantastic location. If you're hoping for a holiday that evokes a sense of peacefulness and natural beauty, this is the hotel to visit. 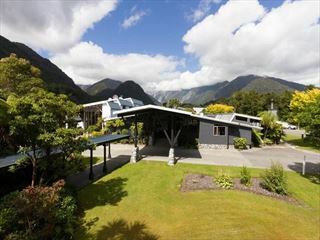 Nestled along the edge of Westland World Heritage Park, this hotel offers comforting furnishings perfect for relaxing and watching the world go by. 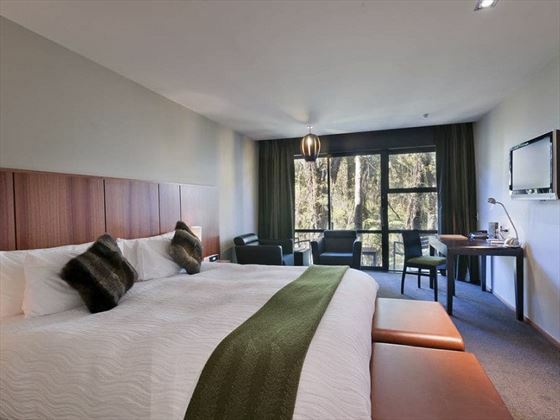 This stylish property sits at the heart of Queenstown - an intimate hotel that allows for easy access to the major attractions of the city.